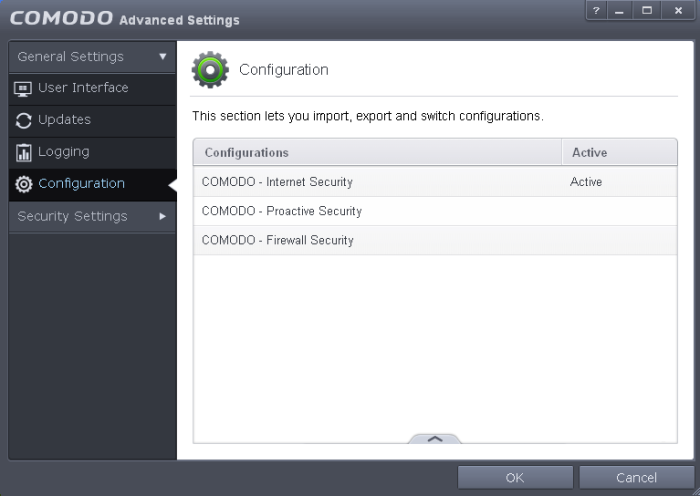 Comodo Internet Security allows you to maintain, save and export multiple configurations of your security settings as configuration profiles. This is especially useful if you are a network administrator looking to roll out a standard security configuration across multiple computers. If you are upgrading your system and there is a need to uninstall and re-install Comodo Internet Security then it can be great time-saver to export your configuration settings beforehand. After re-installation, you can import your previous settings and avoid having to configure everything over again. Note: Any changes you make over time will be automatically stored in the currently active profile. If you want to export your current settings then export the 'Active' profile.